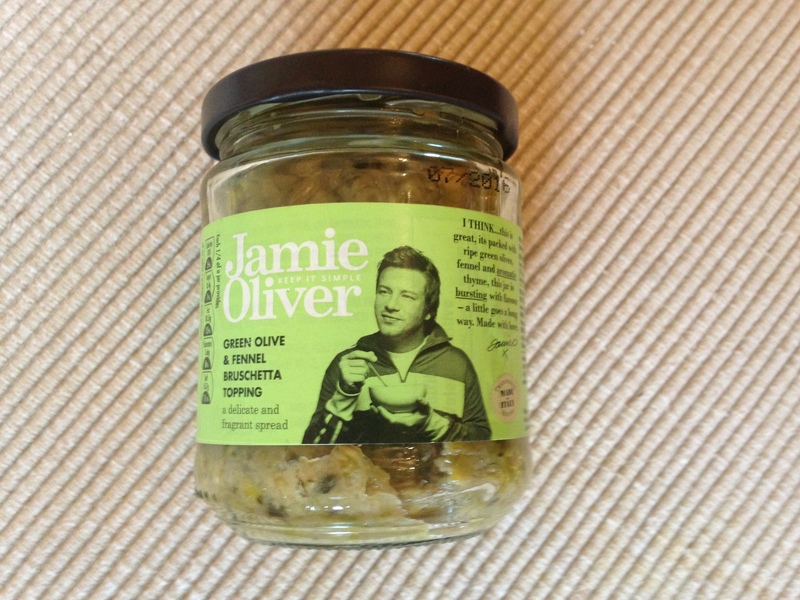 It’s been some time since I wrote about Jamie Oliver. It’s not because he has a lack of products, it’s more a lack of interesting products. I’m not bothered by lasagne sheets or balsamic vinegar but as I was scouring the aisles of B&M Bargain I spotted some bruschetta topping and I thought that had to be worth a try. Jamie gets a lot of stick and has the piss taken out of him. People use him as a hate figure as they can’t seem to reconcile the fact that he is outrageously rich with the fact he has a moral purpose. Personally I think that’s admirable and it’s a goal I would happily aspire to. I’ve spent my life working in the charity sector grafting away for causes I believe passionately in, I’m very happy to keep doing so, but if I could simultaneously get myself onto the rich list and make a big impact at a national/governmental level then I would happily sign on the dotted line. Having said that all that I’m not blind to the fact that watching Jamie can set off my internal cringeometer. Similarly the fact that Jamie brings topical issues to the fore doesn’t mean he shouldn’t be criticised if he opens a crap restaurant, or unleashes a grim product onto the supermarket shelves. So with that in mind I set about tasting his bruschetta topping. The jar is not particularly helpful in describing how to use the stuff. There are instructions for storing it, warnings that it was produced in a factory that may contain nuts but nothing about how to actually use the product. Jamie’s message to his customers reads “I think… this is great, its (sic) packed with ripe green olives, fennel and aromatic thyme, this jar is bursting with flavour – a little goes a long way. Made with love. Jamie”. I’m slightly worried about Jamie’s lack of confidence in his own product – he won’t confidently state that it’s great – he just thinks it is. Then there are those three dots after the “I think” making me wonder if he just doesn’t know what to say next. Maybe he was going to say “I think… this stuff is disgusting, but my marketing team are confident it can turn a profit” or “I think… I know what’s in it but some development chefs I’ve never met came up with it so fingers crossed”. Either way I was ready to take the plunge. I toasted a slice of my prized home made sourdough and hoped it wouldn’t suffer an undignified death. I opened the jar and was hit with a waft of olive and some oily green lumps that I gently spread onto the the toasted bread. It tasted overwhelmingly of olives, a flavour I’m not that keen on at the best of times. It was salty, lumpy and slimy and I got hardly any flavour apart from olives and oil. I couldn’t detect the fennel and I couldn’t detect the aromatic thyme. The lack of complexity could be due to my sensitivity to olive, but equally I did try hard to savour the topping to see if I could tune into other flavours but to no avail. In my quest to give this a fair chance I then did something I will never forget. I set aside the toast, dipped in a spoon and ate the topping all by itself. The cold lumpen mush hit my palate and I instantly recalled a passage from Dave Eggers A Heartbreaking Work Of Staggering Genius where he talks about his terminally ill mother and a plastic receptacle she holds into which she hacks up and spits out putrid green fluid. 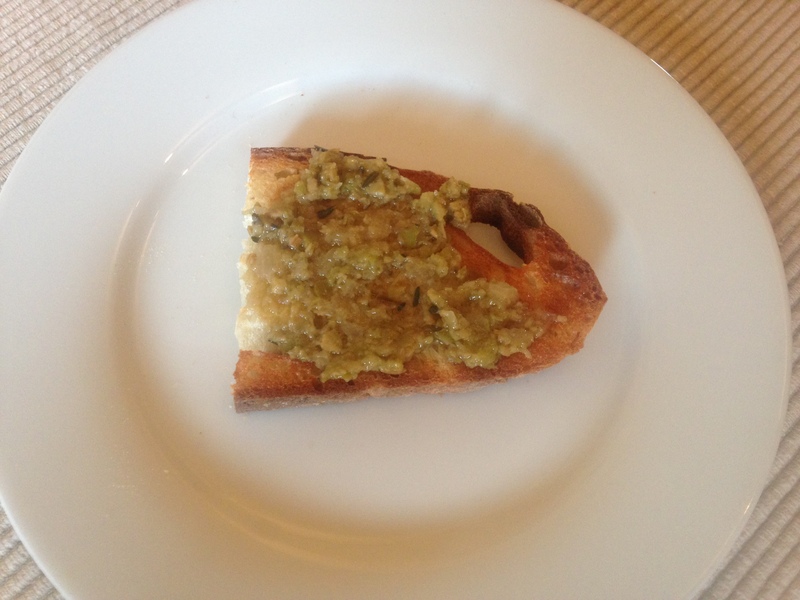 The memory of this caused me to retch and whatever hope there might have been for Jamie’s bruschetta topping was now banished in my mind, irreconcilably entwined with Dave Eggers mother’s sputum. I appreciate that this review is skewed by my feelings towards both olives and Dave Eggers, vivid writing style but even so I can’t imagine this bruschetta holding pride of place in any kitchen cupboard. This entry was posted in Uncategorized and tagged A heartbreaking work of staggering genius, B&M Bargain, Bruschetta, Dave Eggers, Jamie Oliver, Olive and fennel. Bookmark the permalink.